2o-26 September, Betio– A capacity building programme for over 30 staff from TUC and BTC, joined by five participants from nearby ETC in North Tarawa, took place at BTC. It was aimed at making supervisor-level staff more effective in carrying our their roles and duties, especially in serving their customers and the general public. The training was co-coordinated by Eliza Tokataake, the Urban Management Officer from the Ministry of Internal Affairs (MIA). The topics included Communication Skills, English Language, Registry Procedures and Filing System, the Local Government Act, Election skills, Financial Management, Customer Service, Making and Executing Work Plans and many more. The trainers included officers from MIA, KFHA, KiLGA and others. In her opening remarks, the Secretary of MIA, Bwakura Metutera-Timeon, encouraged the participants to take advantage of the training and use it to improve their work and services for their Councils. She also thanked the NZ High Commissioner in Bairiki for his strong support to Local Government in Kiribati. The closing and presentation of certificate took place on Tuesday, 26 September, at LMTA’s Koakoa Restaurant in Antenon, officiated by Hon. Atarake Natara, Minister for Internal Affairs. 4-9 September, Jeollabuk-do, Korea – KiLGA was, for the first time, represented at the United Cities & Local Government for Asia and the Pacific (UCLG ASPAC) Congress by the Executive Officer. The congress took place at Gunsan Saemangeum Convention Center (GSCO) attended by over 600 Local Government officials from Asia and the Pacific, with New Zealand and Kiribati coming from the latter. The EO made a presentation on current stages of Climate Change in Kiribati, during the ‘Sinking Islands’ session, joined by a speaker from the Maldives. The last day of the congress was taken up by elections of members of the Presidency, the Executive Bureau and the Council. KiLGA was elected to both the Bureau and Council. 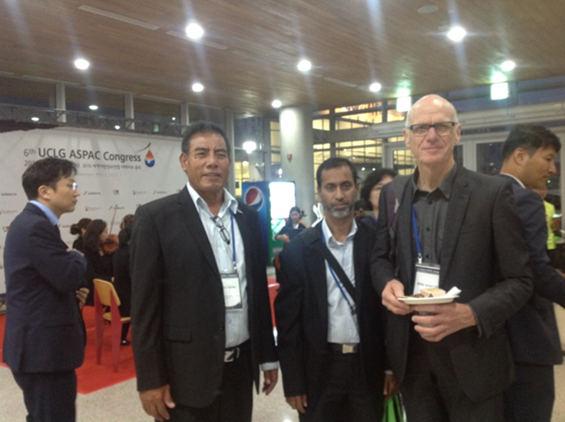 KiLGA’s EO, posing with representatives from the Maldives and NZ at the UCLG ASPAC. 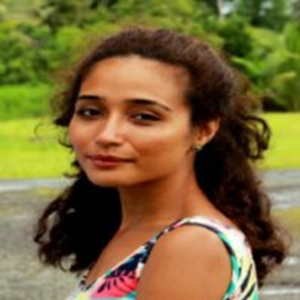 2 September, Suva, Fiji – The EO visited the Japanese Embassy to meet with Ms. Talei Lange (pictured), a JICA officer, to discuss how KiLGA can access the Japan’s Grant Assistance for Grass Roots and Human Security Projects. Ms. Lange informed the EO of the procedures for making proposals and issued copies of the Grant’s details. JICA’s assistance focuses on projects that improve Basic Human Rights (BHR) and Humanitarian issues at that community level. JICA has provided financial assistance to Local Government in Kiribati, such as funding the Kiritimati Urban Council’s (KUC) construction of classrooms for pre-school classrooms in 2015. Wed. 31 August, Suva Fiji – KiLGA’s EO visited the CLGF Pacific office in Suva where he worked with the Director, Karibaiti Taoaba, to discuss and finalise the BTC and ETC’s Strategic Plans and Applications for Local Economic Development projects. BTC’s project is ’Pig Meats’ aimed at slaughtering and marketing pig meat, while ETC will set up a poultry scheme to produce and sell eggs. TUC is yet to identify its LED project after its proposed ‘Revolving Fund for LED’ was not approved. 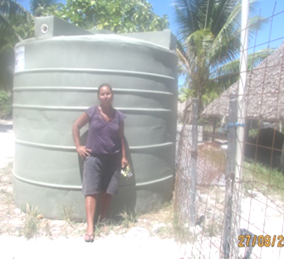 The Maiana Clerk, Terainamn, posing near a water tank at Toora village. 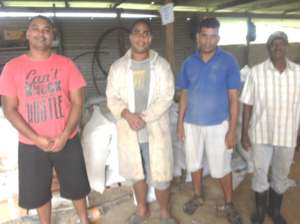 26-28 August – KiLGA’s Office Assistant, Tekeaki Tebotu, flew to Maiana to monitor water tanks there. She reported that all water tanks and materials for the roofing and base have all been received save for two villages. However, the communities require time and a technical person to assist them construct the system but are very willing to contribute their labour and local materials, so that they can have clean rainwater for their children and themselves. 20- 23 August – The EO visited Onotoa to see and report on the progress of the water tanks provided by the UNICEF with EU funds. The water tank systems were already built but a lot of work still need to be done, including fixing roof catchments for the systems. It was noted that the Council did not have the EU-UNICEF Water Tanks. The EO used the time on the island to collect data and take pictures to be used for the Council Profile. He also met with the full Council on Monday 22 August, when the Council reported on the progress of the water tanks in their respective communities and made requests for more. Three villages did not get a share of the systems, despite the fact that they are the ones that have the most urgent need for water. 12-18 August, Betio Village – A ChildFund Team comprising Shona Jennings (Director of Programmes) , Richard (Rick) Steel (Kiribati ChildFund Officer) and Graeme Nicholas from the Institute of Environmental Science and Research Limited (ESR), conducted a series of workshops involving Betio Village communities’ representatives to finalise the design of a project that ChildFund, assisted by KiLGA and BTC hope to start in early 2017. The team also held meetings with officials of the Ministry of Health and Medical Services (MHMS), Ministry of Labour & Human Resources Development (MLHRD), Ministry of Women, Youth and Social Affairs (MWYSA), the Kiribati Police Service (KPS), among others. 4-11 August – Mayor Romano Reo, the Deputy Chairman of KiLGA, accompanied by the EO and Emaima Tokitebwa from UNICEF’s office, visited Arorae to monitor progress of the Water Tanks provided by the EU-UNICEF. 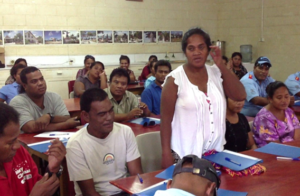 While on the island, the team consulted with the full Council and representatives of the communities to discuss WASH, drafted the council’s Strategic Plan 2017-2020 and scrutinize the Local Government Toolkit, or ‘Ana Kete ni Waki te Kauntira’. 20-24 July, Butaritari – The Deputy Chairman of KiLGA, Mayor Romano Reo was accompanied by the EO on a tour of Butaritari for the dual purpose of trialing the ‘Local Government Toolkit’, and monitor the progress of the EU-UNICEF Water Tanks project, jointly-implemented by Kiriwatsan 1 and the Butaritari Island Council. 7 July, USP Campus, Teaoraereke – KiLGA was one of many representatives invited to the UN Pacific Strategy Consultation, held at the campus. The main aims of the consultation was to reflect on the key achievements and lessons learned from the work of the UN in Kiribati, compile expectations and priorities that the UN should focus on during 2018 – 2022 period, and reinforce UN commitment to the SAMOA Pathway and support to Kiribati to achieve the SDGS by 2030.